How Does Evidence Get Tossed Out of Court? The Motion to Suppress! How Does Evidence Get Tossed Out of Court? 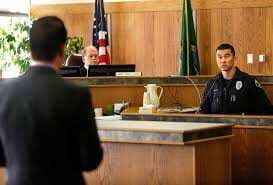 Many clients ask “how does evidence get tossed out of court?” At trial, your criminal defense lawyer may challenge the evidence against you through the cross-examination of theUse a Motion to Suppress to Challenge Illegally Seized Evidence prosecution’s witnesses. However, before trial your attorney may raise significant challenges to the evidence against you – perhaps even get the evidence tossed out – by filing a motion to suppress evidence if your lawyer believes the police violated your constitutional rights in obtaining the evidence that the prosecutor now wants to use against you. A “motion” is a formal written request filed with the court. A motion to suppress is a request that the court toss out or “suppress” certain evidence in a criminal case. What types of evidence can be suppressed? Evidence that was unlawfully obtained, in violation of your constitutional rights, is subject to suppression. This includes tangible physical evidence (for example, a weapon, drugs or drug paraphernalia, clothing, or a computer); testimonial evidence (like statements you made to the police, including an alleged “confession,” or statements overheard by the police); or out-of-court identifications by means of a photo array, mug shot review, lineup or show-up. Even evidence derived from other unlawfully obtained evidence can be suppressed. What are the common legal grounds for a motion to suppress? The United States Constitution and your State Constitution establish your fundamental rights in relation to the criminal justice system. State statutes also establish legal grounds to suppress evidence. These rights include the right to be free from unreasonable searches and seizures; the protection against self-incrimination (so that you cannot be forced to be a witness against yourself); the right to an attorney to assist in your defense; and the right to due process and equal protection under the law. If those rights are violated, you may have grounds for a motion to suppress. What types of situations might support a motion to suppress? (a) An unlawful search and/or seizure. These may occur if: officers had no warrant in a situation in which a warrant was required; officers had a warrant, but it was defective or flawed; officers had a proper warrant, but it was improperly executed; officers were not legally on the premises where the evidence was seized; the search exceeded the area specified in the warrant; or the search went beyond the items specified in the warrant. (b) An unlawful out-of-court identification. This may occur if the process used to identify you as a suspect was unfairly prejudiced against you. For instance, having the witness review mug shot books or a photo array or line-up at the police station in a way that improperly suggested who the witness should choose. (c) A break in the chain of custody. Detailed procedures are in place to safeguard evidence and ensure it is not tampered with from the moment it is seized until the moment it is brought to court. If these procedures are not strictly followed, then your right to due process may have been violated and your attorney may have grounds for a motion to suppress. (d) An unlawful custodial interrogation is another example. You may have been subjected to an unlawful custodial interrogation if: you were not advised of your rights; officers continued to question you after you requested an attorney; the conditions of the interrogation rendered your statements unreliable; or you were subjected to physical force or threats during a custodial interrogation. When is a motion to suppress usually brought? A motion to suppress is usually filed before trial once your attorney has had an opportunity to review the police report and other evidence and conduct an independent investigation. My lawyer filed a motion to suppress. What happens next? The judge will either rule on the motion immediately, based on sworn statements and other evidence filed with the motion, or set a date for a hearing. At the hearing the judge will hear testimony from witnesses and legal arguments from the attorneys. The prosecutor will call law enforcement officers to testify about what happened during their interaction with you. Your lawyer will then will have the opportunity to cross- examine these officers. The goal of cross-examination is to show the officers’ testimony is unbelievable because of bias, a motive to lie, an inability to observe what they claimed to have observed, or their impaired perception. Your attorney can also undermine an officer’s credibility by showing their testimony at the hearing is inconsistent with what they wrote previously in their police report. What happens if I win the motion to suppress? If the judge rules in your favor, then the evidence at issue in the motion will be banned from court (“suppressed”). This means the prosecution cannot use it in court to prove its case against you. The prosecution still is allowed to prove its case using other evidence. If, however, the evidence that was suppressed is so crucial to the prosecution’s case that there is insufficient evidence remaining to prove the charges, the prosecutor might decide to dismiss one or more of the charges, or even the entire case. At the very least, winning a suppression motion may result in a better plea offer. Finally, in certain situations the prosecution has the pre-trial right to appeal the judge’s decision to grant the motion. What happens if I lose the motion to suppress? If you lose the motion to suppress, then the case continues moving forward toward trial. However, even if you lose, this process can be valuable to the final outcome of your case. After all, a motion to suppress gives your criminal defense attorney an opportunity to learn more about the prosecution’s case, to observe the prosecutor’s style and demeanor in court, and to see how the officers involved react to cross-examination. All of this will be will be of great assistance at trial. If you ultimately reach a plea agreement, or get convicted after trial, you will also have the right to appeal the judge’s decision denying your motion to suppress. What can I do to help my lawyer win the motion to suppress? Motions to suppress are won or lost on specific facts. Your defense attorney needs a detailed and accurate account of exactly what happened in your encounter with the police. Remember that your conversations with your lawyer are protected by the attorney-client privilege, so the substance of those conversations is confidential. Answer your lawyer’s questions honestly, accurately, and completely. Details that may seem unimportant to you may be highly relevant to your lawyer.